As the face of law enforcement in America for almost 50 years, J. Edgar Hoover was feared and admired, reviled and revered. But behind closed doors, he held secrets that would have destroyed his image, his career and his life. This fall, Clint Eastwood is opening those doors in J. Edgar, starring Oscar nominee Leonardo DiCaprio as J. Edgar Hoover. EW's Fall Preview includes a new first look image and despite the many set photos taken for this, this one is an official photo of DiCaprio delivering a Hoover speech. Though I know there's plenty more to see coming up, this is still a great first look and enough to keep me intrigued. Head to EW for more fall previews. J. Edgar explores the public and private life of one of the most powerful, controversial and enigmatic figures of the 20th century. Directed by Clint Eastwood (Million Dollar Baby, Changeling, Gran Torino, Invictus, Hereafter) from a screenplay by Dustin Lance Black (Milk, "Big Love"), the film stars Leonardo DiCaprio as well as Armie Hammer, Naomi Watts, Josh Lucas, Judi Dench and Ed Westwick. The story traces Hoover's life from his childhood through ascent to power in the 20s, his 50-year reign over the FBI, and death in 1972. 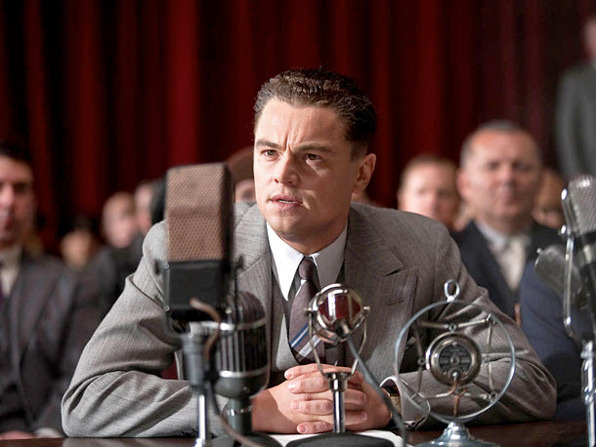 Warner Bros is releasing J. Edgar limited November 9th. Clint still on top of his game putting young directors to shame! Saw a sizzle reel of Warner products at CineEurope and they had about 5 minutes of this film in it. I'm far from a fan of Leo but if his performance is as good as the footage I saw indicated he'll get a nomination for sure. Looks to be the year DiCaprio finally get's his Best Actor Oscar. isn't that just a picture from the aviator? Seems like it. That's the first thing I noticed. Yeah, his eyes looked creepy on first glance. I'm pretty sure he has blue eyes. Leo has blue eyes, they put on brown contacts to make him to look more like Edgar.